This post reminds me so much of my mom. No, I wasn't young enough to go through a Harry Potter phase and I haven't even read the books -- they don't interest me, although I have seen a couple of the movies because we had them at camp and the kids loved them. That's beside the point, though. 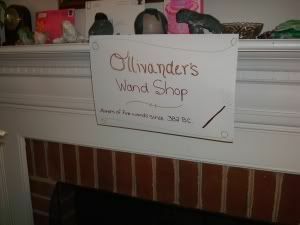 The point is, look how much time and effort she put into the Harry Potter themed birthday party! I won't give examples or even say "hey, she even did such 'n' such." No. Just go look. It'll take you less than 30 seconds if all you even do is go look at the pictures, because they tell the story on their own pretty well. And how is that like my mom? Because I can remember very little from my childhood, strangely enough, but what I 'do' remember is mainly things my mom did, especially for birthdays and Halloween. I remember a scavenger hunt birthday party when I was really little.....my Hungry, Hungry Hippo game (which I still own, by the way) was in the refrigerator and there was an angel fish (in the bag, of course) in the bathroom sink. We were recently discussing past birthday cakes my mom has done and there were oh so many that she created. No, she didn't pick them up from the store, nor did she generally use standard molds bought at the store. To name a few, she did a 3-D double rainbow, a 3-D ladybug, Raggedy Ann and Andy for a double birthday we had, Mickey Mouse, a Hershey bar, a lobster.....so many that I can't even think of right now, but I can picture them all. I used to love the cakes she made. She still makes them actually. For M's birthday she had a cheese cake....no, literally, it was a 3-D triangle wedge of "cheese," complete with mouse. And my little sister requested a Kit-Kat mountain along with her cake. Yes, she stacked and built a mountain out of Kit-Kats. I was at a yard sale this summer and spotted a rubber ducky cake. Now I don't have an obsession with rubber duckies, but something screamed "you have to have that!" I threw my mom a look and immediately went into "can you please, please, make this for me!?" Yes, I went into cute, little, "I'm your daughter and I don't ask for hardly anything" mode. I haven't been home for a birthday in several years, of course, and my special birthday cakes ended long ago. I graduate in December, though, and I'd already decided that I wasn't going to do the whole graduation ceremonies here. Instead, I wanted to go home and have a get-together with family and friends because I only see my mom three times a year....which means much of the rest of my family I haven't seen in a long time. And so it was born. Within minutes, I had a rubber ducky mold (hey, it'll make it easier for her) and a complete idea in my head of how I wanted my cake (the duck won't feed everyone.....so there's gotta be a blue lake, too, hehe). I was giddy. It was silly and crazy and more than likely un-adult-like, but there is nothing wrong with enjoying life. All of this came flooding back when I was glancing over Jen's birthday party post. I can only hope that I make the time and put the effort into my kids' parties like she and my mom do. And hopefully, I'll continue to have as much fun with them. After all, I get excited for the little ones' birthdays and thrive on the energy of little kids....so if I can help make that even more magical, everybody wins, right?